In contrast to the US where mechanisation was driven by high wages and restrictive labour practices, in the Soviet Union, labour was cheap and plentiful but capital was scarce. Studies on the use of railways for military operations started almost immediately after the end of the war by organizations such as the United States Foreign Military Studies program, which conducted interviews with former German military transportation officers such as Bork and Teske and supply officers such as Toppe, but these concentrated both on the German viewpoint and that of military officers, not railwaymen. On the transport side, the railwaymen’s story was told by railway officials such as Kreidler, Pottsgeisser and Hahn and post-war historians such as Gottwaldt and Mierzejewski which by and large told a story of a struggle to overcome technical difficulties posed by a ramshackle, old-fashioned, and low-capacity Soviet railway network. This lead has been followed by modern historians such as van Creveld, Supplying War: Logistics from Wallenstein to Patton, Schuler, Addington and the Militärgeschichtliches Forschungsamt, Germany and the Second World War in the very few studies that have been conducted into German logistics during the Russian war. Yet this picture sits at variance both with the extensive Soviet literature on logistics by authors such as G. A. Kumanev Transport in the Great Patriotic War 1941–1945, and N. A Antipenko, In the Main Direction, and Western studies of the Soviet transportation network by economists such as Holland Hunter and Mark Harrison and students of the Soviet railways such as the former British Army officers Westwood and Garbutt. Both sets of sources tell the story of a highly successful railway system that before the war carried almost as much freight traffic as the United States and accomplished this using a rolling stock fleet and length of track only a little larger than that of the pre-war Reichsbahn. This papers shows that the Soviet railways were far from being the technically backward, low capacity network portrayed by the German side. In effect the NKPS possessed two networks, a high capacity network of über-magestrale lines which carried a large proportion of industrial freight on a small number of key routes and a lower quality network which carried the bulk of military freight. Using these the Soviet railway network carried a huge amount of traffic compared to most European railways and the secret behind this was that the NKPS prioritised traffic capacity over all other considerations. So with a few exceptions, all the trains ran at one speed, which was relatively low and this allowed a large number of trains to be handled by primitive signalling systems since they could always halt within visual distance. The low speed and low loading weights (typically around 16 tonnes for a two axled wagon) reduced wear and tear on the lightweight rails and meant that when accidents occurred they were minor and easily repaired. This approach to increasing traffic with no extra capital expenditure arose from the pressures put on the railways during the Second Five Year Plan and were characteristics, ideally suited to wartime operation. 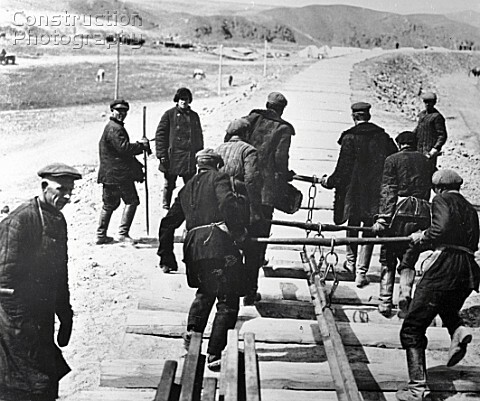 The Germans in Russia suffered from a number of handicaps which restricted the railway capacity on their side of the front and limited military and economic operations. One of the most significant factors was that the military demanded that they control railway operations using the newly created Feldeisenbahn-Direktion and the Reichseisenbahn-Direktion which subordinated railway operations to military needs. This was in direct contradiction to previous experience gained from the American Civil War onwards where railways had operated most effectively under their own management. Another major handicap resulted from the division of Poland in 1939, as the Germans had updated their side of the Polish railways during Operation Otto in late 1940 while the Soviets had only managed to change the gauge of their half of the network and had not begun to upgrade the more rural tracks that they had captured. This left a 300 km wide band of low capacity track between Brest and Minsk which the Germans only began to update in 1942. While the German military faced a challenge in altering the gauge from Union to Standard gauge, this was not the momentous task depicted by the soldiers, as previous examples such as the 10,000 miles of Confederate track altered during three days in 1886, had demonstrated. Also documents held in BAMA show that sufficient track had been altered by August to provide 7 double tracked lines from the border all the way to Moscow. Under the original logistics scheme, the first round of encirclement battles were supplied by lorries of the Grosstransportraum from depots on the Polish border then for the second round of encirclement battles, a Supply District was set up at a distance of 300 km from the border and supplied by double track railway lines while the GTR lorries connected this with the advancing armies. However General Halder recorded in his diary at the end of July that the Eisenbahnpioniere were too concerned with keeping a low capacity railway service right up behind the armies and were neglecting to build the high capacity service to connect the border with the Supply District. Captured German maps found in the Russian archives show that by the beginning of August the railways were unloading at Smolensk but the lack of capacity meant that only a basic level of supplies could be sent forward. This did not seem too much of a concern until after the Battle of Smolensk when the Soviet armies escaped encirclement and continued their resistance. This demanded a third round of encirclement battles but the reinforcements and supplies could not be brought forward as the GTR was worn out and the railways lacked the signalling, depots and facilities to provide regular services. German railway situation 28th August 1941. Three lines unloading in Smolensk area but lack of capacity denies Heer opportunity to build up forces for Operation Typhoon launched on 2nd October 1941. While the Germans struggled to provide sufficient railway capacity for their armies in the East right up to 1944, the Soviets with a field army of at least double the size, managed to concentrate forces and materiel at several points along the front line for a rolling series of offensives from 1943 onwards. The advance of these offensives were often directly supported by railways that determined both the reach and the speed of advance, especially by the Combined Arms Armies. 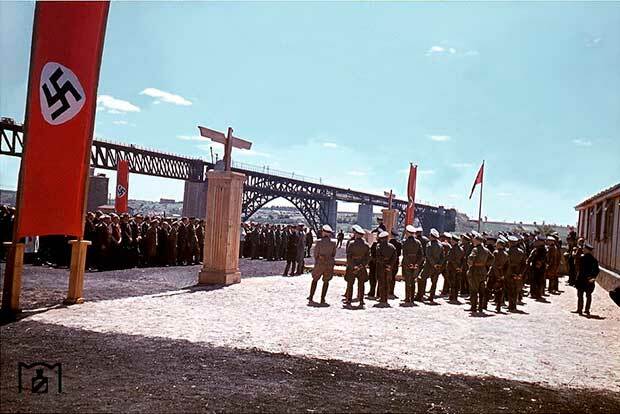 At the same time, the ability of the Red Army to conduct these operations depended on the gathering of recruits and weapons from across the entire Union and directed to the front, as well as the functioning of the national economy. The substantial advantage in railway capacity of the Soviet Union over both the German Heer and the civilian economy of the Reichskommisariats was a decisive factor in their defeat.